The Yankee Rebel Tavern on Astor Street on Mackinac Island. As soon as we got off the ferry from the mainland, we started looking for food. 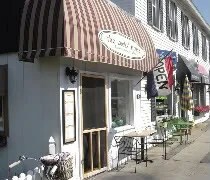 Mackinac Island has a number of restaurants downtown and none of them are chains. That makes choosing some place to eat when you’re only going to eat two meals on the Island a little difficult. Before we took the trip, I did my research online like I always do before out-of-town trips and one of the places that stood out to me was a colonial themed tavern. We went looking for that on Main Street and just happened to look down one of the side streets to see the sign. 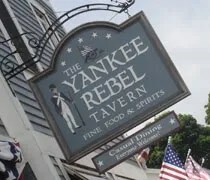 The Yankee Rebel Tavern is on Astor Street between Main and Market on Mackinac Island. As the name implies, there is a little bit of a colonial theme to the place. We got to the Island about 12:15 and this was stop #1. Even though it seemed like there were quite a few people on the Island, I was a little surprised when we got in the door and didn’t see anyone. The hostess took us to a booth along the wall and set down plastic place mats in front of us as well as the menus. On the way to our table, we saw one other party at a booth near us. That would change very quickly. 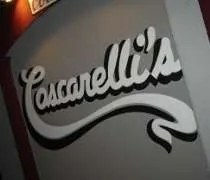 Coscarelli's Restaurant & Lounge on South Cedar Street in Lansing. Have you ever noticed that big grey building on South Cedar Street with the word “Coscarelli’s” painted across the front? I’ve noticed it, but never knew it was open. There are no windows or signs that show any sort of life at the place. The parking lot is around back and not really visible from the street. We’ve lived here for almost ten months and had no idea the place wasn’t abandoned. Last week, we were driving by and I happened to notice some cars in the parking lot behind the building. Later in the week, I was driving down Cedar again and decided to turn in to the parking lot and scope the place out. What I found was a lot of cars hidden by the big grey building. Not only Coscarelli’s open, they seem to be packed. I had a late afternoon job interview and wasn’t sure how long it would take or how I would feel afterwards, so I told J I would pick her up on her dinner break and take her out to eat. Our original plan was to check out the new Brothers Restaurant in East Lansing until I remembered there was a home basketball game. J just said she wanted a salad and didn’t want to go to a chain. On my way home from the interview, I drove by Coscarelli’s again. When I got home, I did a Google search for a menu and actually found one. J approved so I picked her up at a little after seven and headed to that building we used to think was abandoned. Another lazy Sunday. J and I were laying on the couch watching a Fox News Channel special about corruption in Illinois. We didn’t learn anything that we didn’t already, but it’s fun to see the rest of the country coming to the same conclusions we had five years ago about the current political situation in Illinois. Neither of us were in much of a hurry to do anything, but my tummy was really growling. I was hungry. We needed to run a few errands, so we just decided to eat out. I asked J what she wanted and she said a nice big salad with dried fruit, nuts, and cheese. That really narrows it down. Nothing was coming to mind. 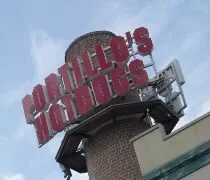 I went to Google and typed in “Restaurants in Lansing, MI.” I do that a lot for out of town meals because it gives you a list of all the restaurants in town. I started clicking on website links figuring the chain restaurants would have what she was looking for. I clicked on a couple and got a “yeah, those look ok” response. 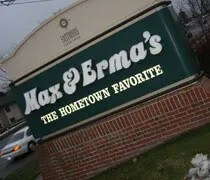 When I clicked on Max & Erma’s I got a “YES! That’s what I want!” Off to Eastwoode. 7:30 AM is early. Not for most people, but for J and me, anything before about 11 AM might as well be pre-dawn. Why were we up so early, you ask? 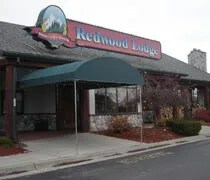 Our goal was to be on the road by 9:00 AM and in Traverse City by lunch. Guess what? We made it! Out the door by 8:30 and in the Cherry Capitol by noon. Our first stop was going to be lunch. I had been scouting this one out for a while. I noticed a blog on Good Food Hunting called From Behind the Stove. The writer is a chef at a tiny restaurant near downtown Traverse City. I knew if we ever made it north, The Cooks House would definitely be a stop. 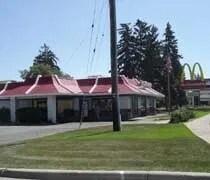 Surprisingly, McDonald’s is one of my favorite fast food restaurants. I don’t eat there often because I don’t eat fast food all that much, but I do really like their “burgers.” Since moving to Lansing, I haven’t eaten at one even though there is one right down the road from our place. J and I needed to make a run to Target this morning to get a diaper bag and some bottles…..for my brother who’s wife is expecting my first niece in about seven weeks. While we were out, we decided to just run and grab lunch instead of coming home and trying to make something. J wants to get back on the Weight Watchers diet and the only way it will work is if I get on it too. I’m not super excited about it because it takes away all the foods I like and makes me eat larger portions of the foods I don’t. But, she wants to do it and I want to help her, so I’ll do my best.